Today was Jeremy Hawthorne’s trial for charges brought against him back in September. Numerous posts on this website and others (www.richmondlegalsupport.org) detail the charges and circumstances around them. He was facing felony charges for vandalism that happened to 7 tires of VCU vehicles, including 2 cop cars in August. Over 40 friends showed up to the court building today to show their love and support for Jeremy. It was clear that he is part of a large community that likes and appreciates him. Unfortunately, today he was found guilty. There were many aspects of this case which were bogus, including the last minute cancellation of his lawyer, leaving him stranded with a public defender unfamiliar with the case. Jeremy was found guilty of Felony Destruction of State Property worth greater than 1000 dollars. He was sentenced to 12 months in jail, and a fine of over 1300 dollars (the alleged cost of replacing the tires). Fortunately, Jeremy is being allowed to remain out of jail until April 6th, when the details of his sentence will be decided in court. His lawyer will also hopefully be able to begin an appeal process before that date. We hope that court on April 6th and any future appeal dates go in Jeremy’s favor. Jeremy Hawthorne is an asset to the Richmond community, loved by many, friend to many, and will continue to be supported by these people and community, including us. Solidarity and hugs to Jeremy. The Occupied Mind blog has written about the Richmond Occupation, and specifically has this post about the arrests of Hunter and Eric during an Occupy Richmond March. 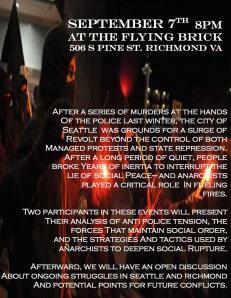 They have specifically addressed the relationship between occupiers and our anarchist collective. They also critique the actions of the Richmond Police Department, and question the singling out of 2 anarchists and long term activists during the march. News and editorials about the Occupy Wall Street movement, with specific local coverage of Occupy Richmond. On Occupy by an Occupier, for everyone. Ever Expanding Library Collection- Come Read this Winter!! The Wingnut Radical Lending Library is a constantly growing collection of anarchist, radical, queer, DIY, environmental, vegan, popular upsrising and more books. Every month we receive new titles from PM Press and AK Press. We also accept donations and purchase books on our own. You can come by the Wingnut during our weekly Open Hours- from 4 to 9pm on Wednesday and Fridays (subject to change however, dependent on other events in Richmond, you can call ahead to check 804 303 5449). We are also looking for people who can volunteer to facilitate Open Hours. We have 944 books available for browsing, reading, and checking out. We also have our ever expanding and newly organized Wingnut Zine Library (over 540 titles so far), which you are welcome to read during Open Hours, but which cannot be checked out. There was another meeting for the Occupy Richmond plan last night at 4pm in Monroe Park. The next get together will be on Thursday October 13that 5:30 pm in Monroe Park. The Occupation will begin on October 15th at 4pm. Everyone will meet in Monroe Park. We will then decide on the location for the occupation and then travel as a group there. At the meeting on Sunday, the group discussed non-violence as a policy, sobriety of the space and what that might mean, possible locations for the occupation, and then split into working groups to start thinking about logistics. bandanas soaked in apple cider vinegar or lime juice (in ziploc baggies) for dealing with tear gas – goggles – milk of magnesia – apple cider vinegar – ear plugs – pen – paper – markers – ID – tents – tarps – blankets – coats – water bottles – food – snacks – games – books – notebooks – cameras – video cameras – chargers – cell phones – medical supplies – medications you take and the prescriptions for them – flashlights – headlamps – batteries – bandanas – hats – banner material – paint – comfortable walking shoes – personal hygiene products – things to share – music – reading material – material for making signs – markers – ponchos/raincoats – herbal teas – vitamins/supplements – comfort food – things that help you feel better when you are stressed etc. We would also like to remind people that the state of Virginia has a no-mask law, so wearing a mask that conceals your face can result in FELONY charges. The Richmond Occupation will be a SOBER space- so no drugs or alcohol or people who are inebriated. This policy is not meant to be exclusive, but to help protect the participants from the police and uncomfortable situations. People who smoke tobacco are asked to be respectful of others, sticking to designated smoking areas that will be created/ staying out of designated non-smoking areas, and picking up cigarette butts. There will be a medical working group, folks with a variety of experience levels who are willing to help keep everyone safe and comfortable. There will be at least one medic station during the occupation, as well as mobile medics during marches. If you have medical skills you would like to provide during the occupation please come to the medic station. They will be using shirts/armbands/ flags with the red cross symbol on them to identify them. These medics are all donating their time and knowledge and are acting as good samaritans. There will also be a safe spaces group at the occupation. These folks will have identification symbols (I believe heart armbands) to make them recognizable. They will be available to help mediate, and to help people under mental/emotional stress and difficulty. Their station will be set up in proximity to the medic station. There are plans being worked on for getting lawyers, legal observers, Know Your Rights trainings throughout the occupation, and more. Folks from the Cyberpunk Apocalypse Collective in Pittsburg will be in Richmond for the Richmond Zine Fest- the weekend of October 7-9th. That Sunday (post-zine fest) they will be performing a variety show at the Wingnut Anarchist Collective at 7pm (after Food Not Bombs). 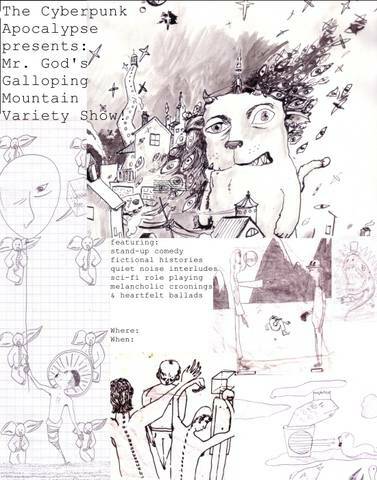 Mr. God’s Galloping Mountain Variety Show! The lineup: stand-up comedy by Gunner, fictional histories of Pittsburgh by famed hotdog reconstructionist and dog food millionaire Todd Faltin, heartfelt ballads and melancholic croonings by a soft-spoken New England gent, sci-fi role-playing by CpA founder DannyMac, and quiet noise interludes by Ken Kaminski! And… local acts? The Cyberpunk Apocalypse (CpA) is a writers’ co-op in Pittsburgh. We publish zines, host readings and such, run a residency program, and write. Gunner’s just-published novel, Galloping Mountain, will be featured at the merch table for sale or trade, plus pretty music and zines! This event is sober and all ages! Richmond Copwatch is planning to continue its patrols of First Fridays in downtown Richmond in the month of October. Join us, meeting at the fountain in Monroe Park at 6pm on Friday October 7th. Bring cameras- video or still, cell phones, flashlights or headlamps, water and snacks if you have them. Please dress for the weather and with shoes you are comfortable walking around in for a couple of hours. If you are able to, we recommend that you get in touch with Copwatch ahead of time for a Know Your Rights training and a brief How to Copwatch training. We will coordinate groups for that evening in the park, and also arrange for a group debriefing at the end of the night. August was the first month we did an official patrol of the First Fridays event (after over a year of doing Copwatch in Richmond), and one Copwatcher had a tazer put in their face by a Richmond Cop. In September, a smaller patrol went out and was assaulted and harassed by the Richmond police, culminating in one member of Copwatch being arrested at the end of the night on bogus charges. We refuse to be intimidated by the illegal actions of the Richmond Police Department. The aggressive, illegal, and unprofessional behavior of the Richmond Police Department as a whole, simply goes to show the necessity of Copwatch, and the regular observing and recording of a police force as long as one exists. Beyond that the continued violent and oppressive behavior of many members of the Richmond Police Department goes to show the systemic nature of problems with police- problems that will be solved not through reform, but through abolition. As long as the police congregate on Broad Street to oppress and antagonize largely youth of color in order to maintain the gentrifying aspects of the First Fridays Artwalk, Copwatch will be there. Wednesday, September 7th, 8PM – at the Flying Brock Library (our friends) in Oregon Hill at 506 South Pine Street. We will be doing our usual Open Hours from 4-7:30 then biking on over to the Flying Brick for this event. Join us! After a series of murders at the hands of the police last Winter, the city of Seattle was the ground for a surge of revolt beyond the control of both managed protests and state repression. After a long period of quiet, people broke years of inertia to interrupt the lie of social peace–and anarchists played a critical role in fueling the fires. Two participants in these events will present their analysis of anti-police tension, the forces that maintain social order, and the strategies and tactics used by anarchists to deepen social rupture. Afterward, we will have an open discussion about ongoing struggles in Seattle and Richmond, and potential points for future conflicts. As always, Flying Brick events are sober unless otherwise noted. Please don’t bring any drugs, alcohol, or show up intoxicated. Thanks! Hope to see all of you there! I was at home on Friday night, not participating in Copwatch due to other conflicting activities. The phone rang, and on the other end was Copwatch Member D, who quickly related that another member of Copwatch, M, was being detained by the police. D said that the police were not allowing them to get anywhere near M, and that because all of the Copwatch cameras had been placed in M’s bag, the police had them all. I got the location, called to Copwatcher X, and jumped in the car to get to the scene as quickly as possible. Upon arrival we met up with D, and walked to the street where M was being detained. I walked down the sidewalk on Monroe Street, off of Broad (headed South). Quickly, 2 members of Richmond Police Department informed me that if I was going to walk down the sidewalk I would be arrested. I asked what for, and they said Obstruction of Justice. After a long and relatively uneventful night of doing Copwatch for first fridays on Broad Street, S and I were ready to make the trek back to the Wingnut to review the footage acquired over the course of the night. It had been an evening of very large groups of very bored pigs, standing in groups of up to ten up and down Broad St., most likely very upset that there were no younger folks of color to push around to pass the time on a Friday night. After a humorous impromptu interview with the 4th precinct commander, Mike Strawder, S and I had made it back to our bikes, parked in front of the New York Pizza restaurant. S had unlocked his bike, and as I bent to unlock my bike, I felt handcuffs close over my left wrist as another pair of hands closed around my right arm. I looked up, and there were at least 15 VCU and Richmond police officers surrounding S and I, and I was promptly told that I was under arrest and that I had a felony warrant out on my head, though they were not, at that moment, very forthcoming about what I the warrant was for. S jumped to his feet and immediately had his camera trained on the officers and myself, and watched as they moved me to an alley “where no one could see me”. My pockets were searched, my knife confiscated, and my bag taken from me as two undercover agents kept their video cameras trained on me throughout the ordeal. Wingnut Hurricane Update / Help us chop firewood! The Wingnut held up well during Hurricane Irene over the weekend. We lost power, but had a generator to keep our sump pump in the basement going as well as a refrigerator. Food Not Bombs on Sunday went off without a hitch, as folks gracefully adapted to the limited electricity conditions. Which was really great, as other organizations who normally distribute food in Monroe Park were unable to due so on Sunday. There was a larger than usual crowd at the meal and grocery distribution.